As a caravan of migrants heads north toward the United States from Honduras, Donald Trump and Republicans are using it as a campaign issue to scare their supporters and give the GOP some momentum going into the midterms. Republicans are accusing Democrats and George Soros of funding the migrants, but if anyone has an incentive to finance their thousands-mile journey on foot, it’s Donald Trump. The issue needs to be taken into perspective. The Republicans are trying to scare voters over 2,000 migrants seeking sanctuary in the United States. While making 2,000 seem like a huge number, Border Patrol arrests an average of over 42,000 a month. While posting no serious risk to the security of the U.S., they make great campaign fodder for stupid people. People travel in these caravans as there’s safety in numbers from gangs, rapists, and others who prey on the desperate, which is exactly what Trump is doing. And these people are desperate to leave their homes and walk thousands of miles with their children on the slim chance they’ll receive refugee status in a nation with a racist president who really hates brown people. This caravan isn’t a freak occurrence. There was one last April of about 1,200 people, with only 150 reaching the U.S. border. Trump is also using the issue to threaten to withhold aid to Guatemala, Honduras, and El Salvador, which is like banning birth control to stop abortions (Republicans still don’t understand that). The aid we give those third-world nations is to help bring stability. Removing it will make their situations worse, and land more people at our doorstep. He is also threatening to shut down our border with Mexico, which would halt trade. Finally, he’s warning that he’ll send the U.S. military to secure the border, which is probably illegal because the military is barred from performing civilian law enforcement within the United States (though they can provide logistics and other support to Border Patrol). 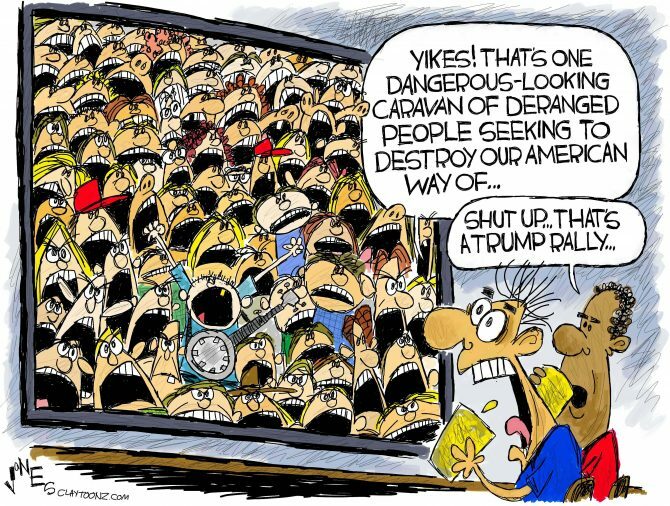 Trump is scaring his base of reprehensible stupid people over a handful of migrants two countries away, traveling on foot, most of which will never make it to the U.S. border. But then again, they scared these dumb people over the threat of taco trucks on every corner. But, this is the new normal where stupidity and lies work, such as claiming Democrats want the immigrants here in time to vote in November. Being horrible works too as Trump has yet to offer any compassion to those running for their lives. For those who do arrive with children, his administration will surely separate them and throw more babies in detention centers. Other than votes from the most hateful among us, Trump and the xenophobic Stephen Millers and John Boltons of his administration will use the issue to further isolate the United States. Illegal immigration is a serious issue, but it’s not the most important or dangerous that our nation is facing. But, it’s great for making scapegoats when you’re enacting a racist agenda. If you really want to see a mob of angry people that are dangerous to the United States, go to a Trump rally (I have. It’s bloodcurdling). Donald Trump’s supporters, the most fanatical, are the greatest danger our nation is facing right now, as they’re willing to tear it apart over a cult of stupid personality. Personally, I’d rather have the caravan.